Hanukkah may have some traditional foods, potato latkes (aka potato pancakes) and sufganiyot (aka jelly doughnuts), but in general the rule is anything fried goes. So, while shopping for potatoes to make latkes, I changed my plans when I saw these striking artichokes in the market. I had to have them. They were beautiful and festive, perfect for a holiday meal. 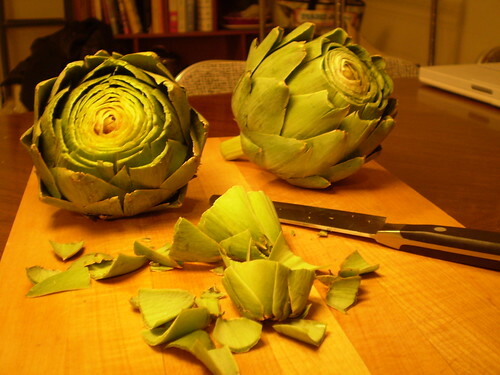 Next, I set out to think about what I could do with artichokes for the first night of Hanukkah. 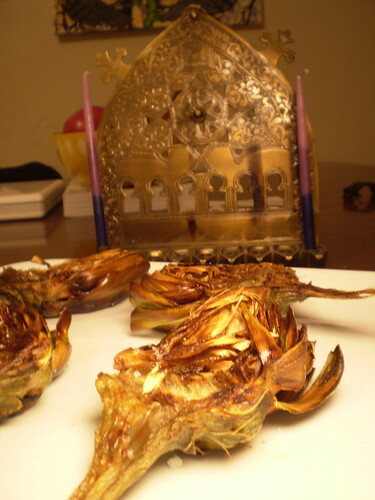 I recalled reading about a fried artichoke preparation that originated in the Jewish ghetto of Rome, simply called Carciofi alla Judea (for more about the history of this dish click here). I have never had one of these prepared for me, but I thought, "how could anything fried taste bad?" Unfortunately, there was nothing miraculous about this meal, except for the amount of olive oil I wasted. I jumped on this idea, lured by images of lightly browned, crunchy, earthy artichoke petals that would impress you and inspire you to put down the potatoes and fry something different. I didn't do my research. 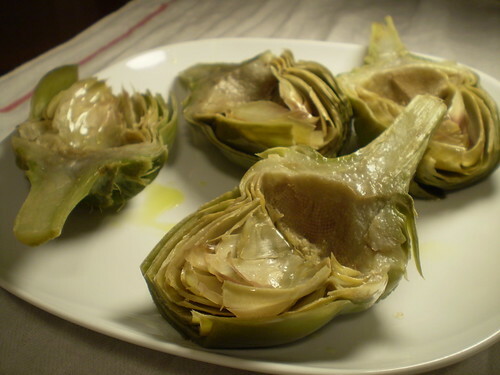 If I had I would have seen that this dish is best prepared with baby artichokes, for their more tender leaves. I might also have realized that frying them whole was an option, as used in some other versions of this recipe. The recipe that I found and put my faith in (it was on a great Jewish blog after all) called for peeling off the tough outer leaves and slicing the artichoke in half before you start on the two-step process of cooking them in a mixture of olive oil and water until softened (see the photo above), and then frying them until crispy. 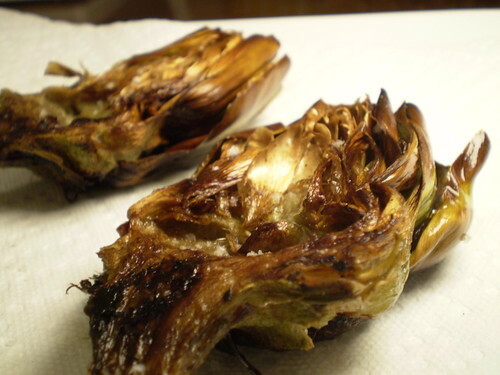 My artichokes looked like fried goodness, glistening as they came out of the olive oil. After a sprinkle of some fleur de sel salt and a squeeze of lemon I could barely wait to grab a piece. I started with the outer leaves that looked more well-done, hoping that it would taste like a crispy french fry. Not exactly. The tops of the leaves were tough and difficult to chew, if not near impossible. "Ok", I thought, not giving up hope, "the inside leaves will be better". They were better, but not great. In the end, I resorted to eating the leaves as if they were steamed, scraping the tender bottom part off and discarding the rest of the leaf. We agreed that it seemed like a waste and definitely not the intended result. The one saving grace of this dish was the artichoke heart. I guess that's why I couldn't be too upset. It was tender and a bit smoky tasting from the oil. It was definitely good eating, especially with a bit more salt. I'm sure my inexperience in making these was to blame for the flawed result. 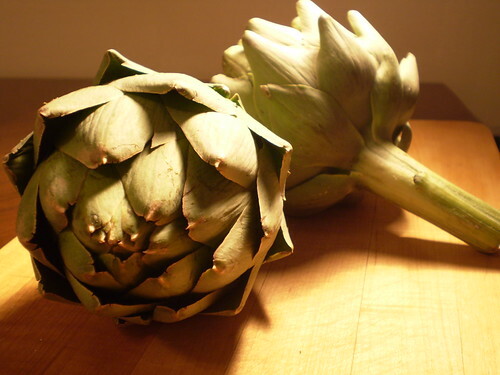 However, I bet they could be spectacular when done correctly, so please do not let that discourage you from trying this dish (just make sure to get baby artichokes). And, the best part of Hanukkah, there are 7 more nights to fry things and get them right.